Mental health speaker and Amazon bestselling author Jeff Yalden came to us live from Burlington, Vermont for Episode 50 of The Boom Podcast – in an unlikely situation for a podcast: The side of the highway. He was driving in from a speaking engagement in New York, and was so taken with the beauty of his surroundings that he was compelled to pull over and share his thoughts immediately. 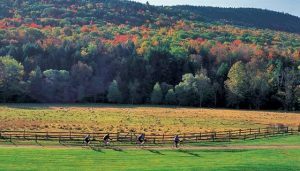 As he was passing by all the kaleidoscopic splendor of Vermont, the thought came to him that many of us are so busy that we sometimes fail to notice the grandeur of our surroundings. He could have easily sped toward his gig without a nod to the wonderful landscape along the way. For a guy now living in the Coastal Carolina region, he noticed the snappy 35-degree weather too, but he gladly embraced the beautiful experience. Happy people are not happy all the time, but happy people celebrate happy moments. If you are at all familiar with Amazon bestselling author Jeff Yalden, you already know that he is passionate about being fully transparent. This includes in large part the fact that he is a man who lives with mental illness, and he is a staunch advocate for mental health. He also believes that mental illness will soon become the biggest public health crisis in the United States. A while back, he went through a setback. “I said things I wish I didn’t say and did things I wish I didn’t do – and then I came to realize that I hadn’t been taking my meds,” he said. While he wishes that didn’t happen, he knows that if you don’t learn from your mistakes, then you don’t grow – and as much as he wishes this setback didn’t happen, he said he appreciated that it did. In Episode 48 of The Boom Podcast, Jeff lays out Day Three of his 28-Day Attitude of Gratitude series, and it’s all about the people in your life who make up your close circle. Who is in your close circle? Who are your confidants? With whom can you share your deepest self without fear of betrayal? Jeff is not talking about acquaintances here. He’s talking about those who will go the distance with you: Your family, your significant other – your trusted friends. No matter how much time goes by, there are certain people in your life that you can call, and it’s like you pick up right where you left off. Consider these people when thinking of your close circle. According to Jeff, part of your self-care should be about being grateful for the people in your life that give you support and love – and that you give support and love in return. This will fill the aforementioned pitcher. Choose the people who truly understand you, and who are not afraid to call you out when you make a mistake. “Do you have two or three trusted confidants in your life? If you do, you are a rich person,” he said. If Jeff wanted to give you a dollar, would you want four quarters or 100 pennies? According to mental health speaker and Amazon bestselling author Jeff Yalden, most of tend to get so busy “on the grind” – with work, family obligations and myriad other daily activities – that we forget about the value of self-care. There was a time in Jeff’s life when he thought self-care was selfish, but no more. A little “you time” is essential for achieving a healthy balance in your life. In episode 45 of The Boom Podcast – Jeff lays out Day Two of his 28-Day program about Living a Life of Gratitude. “I want to encourage you to create a gratitude journal,” said Jeff. “You can do it in a physical journal. You can even do it on your smartphone. I use [an application] called Evernote, where I have all of these notebooks and notes and everything. I put everything in there. The process is simple, but it can be trickier than you might think. As Jeff recorded the video for what was to become this podcast episode, he thought about how grateful he was for anybody that was going to choose to listen to his message. He was sitting outside of his house, on a beautiful patio chair with his pool behind him. He was at liberty to light his Tiki torches if he wanted to – or fire up the barbecue. “This is my home. This is my four corners – my four walls,” he said. Jeff’s challenge is this: Every day, start looking for little things that you appreciate – and you will become aware of more and more of these as you go. “I don’t want you to go through life and take these things for granted,” he said. Remember: No day can be a repeat. You need to search yourself until you discover more things to be grateful for. Create a gratitude journal. It could be a physical journal, or it could be on your digital device. But sometimes creating a notebook on a smartphone is a lot easier. Whatever method you use – start tonight. List just one thing you are grateful for. “Tomorrow, I want you to set a reminder to come up with something else that you are grateful for – and I just want one thing. I want you to put down what you are grateful for – and the WHY you are grateful for it,” he said. “I am grateful that I am sitting on my porch, and I am grateful I’ve got the reflection of the water in my pool – and the beautiful sky behind me. It’s 70-something degrees, and I am able to just sit out here in beautiful Myrtle Beach and just enjoy this. I am grateful for Janet, my fiancée. When you do your gratitude journal, Jeff wants you to get deep with the reasons you are grateful. “Every single day, set a reminder to come up with something. And I promise you that you are going to start to appreciate the beautifully cut grass. You will start to appreciate trees that you haven’t noticed before – the walkway leading up to your house or place of work. You might start appreciating little things about your neighbors. Start your gratitude journal now. Beginning with episode 44 of his BOOM Podcast, Amazon bestselling author and mental health speaker Jeff Yalden has been laying out simple, daily messages about living a life of gratitude. Gratitude is a key component of a life well lived, bringing us into a state that makes us part of a bigger picture and allowing us to be receptive to the many astonishing and surprising moments that we might not have recognized without it. If you follow and implement the daily messages about gratitude in this 28-day program, your life will change. Sometimes we get so caught up in our routine that we forget to appreciate the simple act of being present. On a Saturday not too long ago, Jeff found himself at home in the Myrtle Beach area for a couple of days. He and fiancée Janet had just finished working out and decided to make a run to the local Walmart to do some food shopping. Both Jeff and Janet were having a good day. When it came time to head through the cash register aisle, the thought hit Jeff that many people go through these lines on autopilot – to the point sometimes that they don’t even know if the person checking them out was male or female, young or old. But at that moment, he was having a small conversation with the lady at the register – and he stayed present in the moment. Her name was Alexis – and he was sure to look her in the eye, acknowledge her name, thank her and tell her that he hoped she had a nice day. Jeff made a conscious effort to stop and appreciate the people that he otherwise might have been too rushed to even pay attention to – and since then, he has been sharing this story in his speaking engagements. Soon after this, he found himself driving through Wisconsin to a speaking gig. He pulled into a rest area to use the bathroom – and as he was walking out of the restroom area, he noticed an older gentleman washing the windows. He decided to acknowledge him as well. Why was this guy’s response different? Why was he so blasé? Jeff thought about how sad is it that most every single day, we are so anxious to get where we have to go that we don’t pay attention to the little things. Someone cuts us off as we’re changing lanes and we get upset. We want to get where we are going as quickly as possible. We’re anxious getting into the store and anxious getting out. “We’re late going here because we have to do this or do that – and so, being late – we don’t even pay attention to these little things,” he said. In the next 28 days of the Boom Podcast, Jeff is sharing daily, actionable principles to help you bring gratitude into your life. Today, simply stop and appreciate the little things – those small exchanges that make us feel connected to others. Some people might not return the respect, but Jeff says that’s not our issue. That’s their issue. Also – when we give respect, some people might not give us respect back. That’s not our issue. That’s their issue. 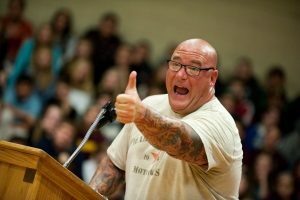 Youth motivational speaker and suicide prevention expert Jeff Yalden has spent much of his career helping people deal with loss. It never gets any easier, and he said he woke up this morning at a loss for words once again – learning more about the victims of Sunday’s horrific massacre in Las Vegas. The question for Jeff is how to prevent this from ever happening again. Now more than ever, we can make a huge difference by being kind and encouraging, supportive, accepting and forgiving. “Diversity is like a quilt; one giant, big blanket made up of many colors, shapes, sizes and fabrics – all woven together to provide warmth and comfort to you and me. Diversity is a great thing,” he said. Yalden has been laying out the daily BOOM principles from his new workbook and planner, The BOOM 28 Day Boot Camp: Creating a Life of Success. Find Motivation. Crush Goals. Overcome Obstacles. Live with Purpose. We hope you have been doing the work every day. “Have you gone back and really done these exercises? If you have done the exercises – you should be feeling pretty good right about now,” he said. Healthy sleep, proper nutrition, and 30 minutes of exercise every day! Yalden said it’s very important for young people to get eight hours of uninterrupted sleep per night -and the average adult needs between seven and eight hours. If you can sneak in a nap during the day for 30 minutes or an hour, go for it. That’s a good thing. Close your eyes. Meditate. Breathe – and just allow yourself to get deep. Get proper nutrition. This isn’t rocket science. Consume more protein and less carbs. Protein builds and repairs muscles. Look at the carbs you are eating. There are good carbs [whole grains, vegetables, fruits, beans] and bad carbs [white bread, white rice]. Get rid of sodas [even diet sodas] and fruit drinks and just go to water or maybe Crystal Light. “There is a chemical in diet sodas that makes you crave more food,” Yalden said. Get out there and exercise. You are almost there. Tomorrow marks the final installment of this BOOM Boot Camp. Day 28. In Episode 40 of The BOOM Podcast, youth motivational speaker and author Jeff Yalden said that we all have a story that we keep to ourselves. Our family and close friends have stories too, and we might only know parts of their stories – often the parts they want us to know. 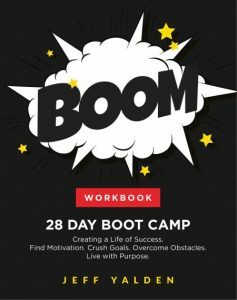 In this blog, Yalden has been laying out the principles from his new workbook, The BOOM 28 Day Boot Camp: Creating a Life of Success. Find Motivation. Crush Goals. Overcome Obstacles. Live with Purpose. According to Yalden. forgiveness is not about forgetting what may have taken place. “We don’t forgive people for them. When we forgive people, we choose to forgive people for ourselves,” he said. Coming from his experience with mental health, Yalden said that one of the greatest things we need to learn with anybody that may have done us wrong is that it doesn’t matter if they think they wronged us or not. “What does matter is that we forgive so that in our heart, we move forward. Remember that none of us are perfect. We have all hurt other people. Yalden suffers from bipolar II disorder, and something he learned a long time ago was that he might react badly to a situation in the moment, and then regret sets in. Reacting badly in an interpersonal situation might include hurtful language. “In those moments, we don’t care – and then in 24 hours, we hate ourselves for treating someone like that, and the pain just lingers,” he said. Yalden said that the two things we can’t take back are time and words. Make sure you understand that a person will either forgive you or they won’t. Sometimes they won’t even acknowledge you. Be prepared for either outcome. “You are reaching out to them and you are apologizing. If they choose to accept your apology, that’s great. If they choose not to accept your apology – that is their prerogative. But at this point, it’s not about you anymore. That’s about them, and you need to walk away and move forward in your life,” Yalden said. Who do you need to forgive? What did they do? Why do you need to forgive them – and if you are able to forgive them, how is that going to make you now feel? Yalden realizes that there are certain things when we might not have been at fault, but we are still responsible for how we handle things – how we react. 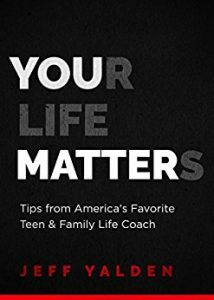 Youth motivational speaker and author Jeff Yalden said that sometimes we get so caught up in your days and what we need to get done that we never stop to think about we appreciate every day. Sometimes we take the little things for granted. In Episode 38 of The BOOM Podcast, Yalden continues to lay out the daily principles from his new workbook, The BOOM 28 Day Boot Camp: Creating a Life of Success. Find Motivation. Crush Goals. Overcome Obstacles. Live with Purpose. This workbook and planner is the perfect companion to Yalden’s Amazon bestseller, BOOM! One Word to Inspire Action, Deliver Rewards, and Positively Affect Your Life Every Day. If you have been taking action daily on the action steps in the BOOM Boot Camp, you already know that these principals can change your life because you have been putting in the work. If you have not yet started the BOOM Boot Camp, stop reading this post and go HERE. One way to ensure that you develop an Attitude of Gratitude is to start and keep a gratitude journal, or a journal of appreciation. As soon as you wake up each morning, write down the five things that you are most grateful for that day. “The challenge is that no day can ever be a repeat of the day before,” said Yalden. When he recorded this podcast episode, Yalden was in Charlotte, North Carolina, preparing for four speaking engagements over the course of two days. He has his video team with him. Gratitude point number two was the fact that he was speaking in the state of North Carolina. Although he lives in the in the Myrtle Beach area, he doesn’t speak in the South very often. Thirdly, Yalden was grateful that he gave himself plenty of time to prepare for these speaking engagements. Point number four was an appreciation for the time of year. In September, it was still nice and warm, but Yalden said there was a little bit of coolness in the air, and the weather was absolutely beautiful. After undergoing weight loss surgery [he is down 85 pounds] and working out regularly, Yalden is feeling good. He has experienced a very definite upswing in his overall health as well as his energy levels. That was point number five in his gratitude journal for that day. He cited author Rhonda Byrne in her mega-bestseller, The Secret, who suggested trying to say “thank you” at least 25 times a day for the little things. Create an Attitude of Gratitude. 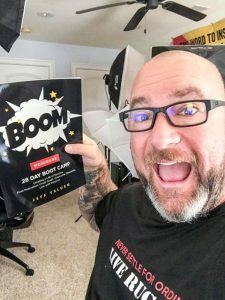 We hope you have been doing more than simply following along as youth motivational speaker and Amazon bestselling author Jeff Yalden has been laying out the daily steps from his new workbook, The BOOM 28 Day Boot Camp: Creating a Life of Success. Find Motivation. Crush Goals. Overcome Obstacles. Live with Purpose. Yalden can deliver these messages until he is blue in the face, but only you can put in the work necessary to bring about the changes you want to make in your life. 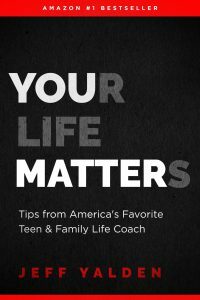 On days 18, 19 and 21 – Yalden talked about looking in the mirror and taking personal responsibility for your life, being accountable, making adjustments and the importance of regular self-assessment. He said it would have been easy to blame is ex, or on family, money or many other things – and sometimes we all do that. But instead, Yalden had a heart-to-heart right there in the mirror, and he asked himself what he had to do with the marriage not going right. Since then, Yalden said that whenever something is not right in certain situations or circumstances, he has continued to go to the mirror to ask what he had to do with these things. “Whether it’s good or bad, whether you are successful or have failed at something – you have something to do with that,” he said. He said you might not be the reason this happened, but you have responsibility for how you move forward. You are responsible for your emotions, your attitude and your choices. Yalden believes [and so should you] that everything that we go through in life molds us into the person of character that we are meant to be. You haven’t learned to accept responsibility for the things you need to take responsibility for. You haven’t allowed yourself to be free and forgive both others and yourself. How can you be more accepting? How can you be more forgiving? 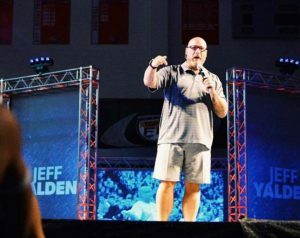 When youth motivational speaker and Amazon bestselling author Jeff Yalden speaks to his audiences, he often talks about coming through the door, checking your ego and opening your heart as you walk out into the world. And if you have people in your life that your life that you trust, respect and whose opinions you value – go to them. Every day is a chance to learn something new. There is something new to learn in every situation. Success is in the lessons that happen around you. “I want you to adopt a growth mindset. Begin every single day with the desire to learn,” he said. Every single day that you want to learn – every single day – so I have got a couple of things. What does your environment look like? Is this an environment to grow? Is this an environment that is supportive for your learning and embracing the growth mindset? In this episode of The BOOM Podcast, Jeff used the example of students. “You either come into the classroom or you sit in the front row – or you go right to the back row. Remember: Most people always go to the back row. I want you to be a front-row player in the game of life. I want you to seek the front row,” he said. Creating a growth mindset, according to Yalden, is like the old real estate phrase, Location, Location, Location. Are you accepting constructive criticism? Yalden said that when people get real with you, realize that their intentions are not to hurt you. Their intentions are to help you. Be Coachable. Embrace Leaning. Have a growth mindset. Know that your environment is important. Be a front-row player in the game of life. 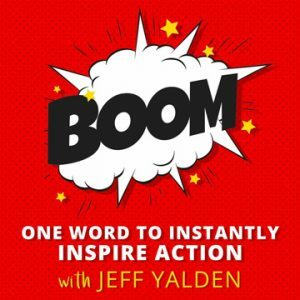 In Episode 33 of The BOOM Podcast, youth motivational speaker and Amazon bestselling author Jeff Yalden laid out the daily principle from Day 19 of his brand-new workbook and planner, The BOOM 28 Day Boot Camp: Creating a Life of Success. Find Motivation. Crush Goals. Overcome Obstacles. Live with Purpose. “A life of success is about making changes where changes need to be made,” Yalden said. As he talked about in Day 18, Yalden said to look in the mirror and take personal responsibility for everything in your life. Today’s principle is a logical next-step. Let’s say you want to lose weight. According to Jeff, talking about something means you are not really committed to doing it. Most people only talk about what they want to do. Very few people take action. When Jeff wanted to learn the Final Cut Pro video editing software, the first thing he did was to hit up YouTube and watch all he could about it and then played with it. If he had a question, he’d return to YouTube until he got an answer and went back to work. Same deal with Photoshop. Stop talking and start doing. Don’t wait until tomorrow, next Monday or January first to take action. Take a step today. Are you doing what you know you need to do? Summon all the fortitude and the discipline you can to make the necessary changes in your life. If your answer is no to any of the above – Yalden said it’s time to make a change.